Building lots on the water costs nothing. Construction is about moving heavy things around which is much easier on the water. You can sell a floating house worldwide so produce much beyond the local market. The economy of scale is much easier on the water. Cement is not comming from a land based plant that locks the local market into a monopoly - it comes in ship from China or elswhere globally. The access road to the development needs not to be built, unimited access for container load sized items, and heavy cranes, is there already. All these factors add up to a reduction in general cost of building a real estate squaremeter which turns over in much lower cost of buy and rent real estate . This means floating real estate has a competetive edge offering the same housing space, the same closeness to the city center, at a potential far lower price than a highrise building on the shorefront in the same area. 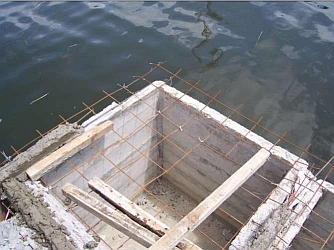 No signifficant difference to land based concrete engineering the wall thickness is between 20cm and 100cm the building method is cast building of massive concrete walls. 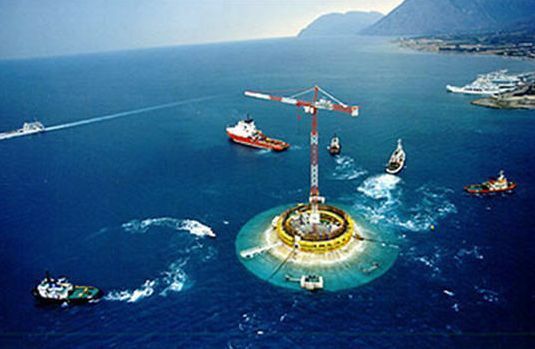 The heavy methods are basicly the usual methods of land based concrete engineering (cast, rebar, aggregates) applied to oceanic structures of industrial size. In all above structures unspecialized concrete contractors where able to perform the construction - just as if it where another bridge, tunnel, highway, from the concrete engineering base book. 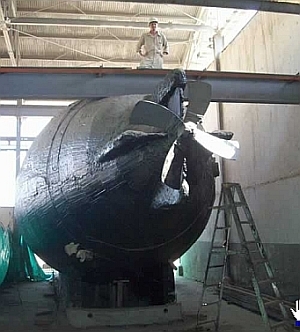 We took that base technology and pushed it a bit further building testing and diving fully functional concrete submarines, built in blimp shape. What we did in our test building sites in Cartagena is taking the established heavy methods and testing out how small you can go to the most possible extreme. Improving some key issues as the colocation of the rebar and its rust protection. Reducing the wall thickness to just 5cm we still get floating elements that are seeping free and stay dry inside with no coating at all. Modular raft up of elements with only 5cm wall thickness. The medium weight method group is still heavier than glassfiber boat shells, but can already be applied with platforms of quite small size of a few meters. Ferrocement building methods are in this "medium group". What makes ferrocement a problematic method is that it is completly dependent on the skills of the builder. The handling of the tedious mesh wire as fiber component is so complicated that many shells end up with rusting rebar falling apart due to spalling in a few months. On the other hand well built shells have survived long term time testing and can have service lifes of many decades. While in the heavy group traditional rebar is completly protected inside thick walls, the medium method group can not always achieve the 2 cm concrete cover over rebar, what makes having deep thoughts about changing the traditional rebar with something else that is less prone to rusting - a key field of the method group. Synthetic fibers, glass fibers, basalt rebar and basalt fibers, come to mind. In this medium method group we also tested a couple of techniques like "printing techniques" the last picture above for example shows Don Arturo standing in a box of 2,5x1,2m that is built up like a matrix printing piece just without the printer and giving the worker a bucket full of material and a teaspoon to put the dots on the building. Works just surprisingly fine ! - as long as you get the material right. The medium group of methods is great for printing with a matrix printer, for contour forming, and similar automated construction tecnologies - as the ocean allows to distribute the built houses globally - a house building assembly line taking advantage of economy of scale becomes feasible. Typical wall thickness a few millimeters, 3-5mm, the "make and feel" of structures performed with this method group is very similar to glassfiber built structures. 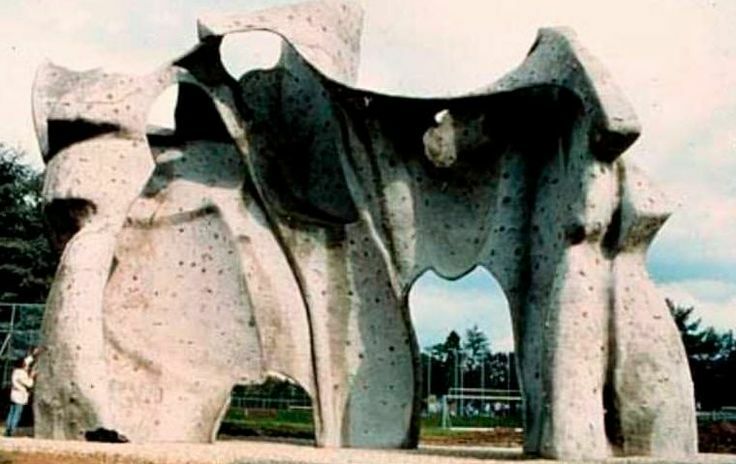 These structures work with different fiber components, and different filler components, as well as different application methods as cast methods are ruled out for few millimeter skins. In the picture, a extreme light concrete honeycomb platform that is comparable to glassfiber build in structural toughness and weight, but much more economic to perform as no expensive resin is involved. A small piece of light honeycomb shell floating - any shape is possible - no form is required the building process is "freeforming". 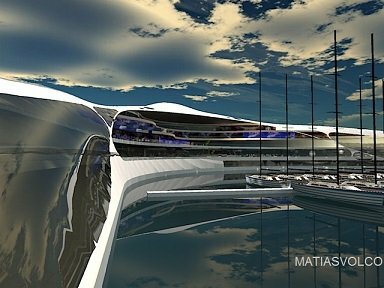 The platform is as light as glassfiber building a structure like the why yacht is in the range of feasibility. We have tested this building method in extensive pilot projects and the outcome money input versus real estate squaremeter output is 166 USD / squaremeter. Light building methods can adopt any shape. In general it is applied in honeycomb shell projects. In its nature concrete is a composite material, with binder (cement) fiber component (rebar) and fillers (aggregates) - the concrete canoe competiton was invented to showcase that you can build literally any type of structure if you use the combination of those 3 base components creativly. Things as small and light as this canoe can be built in concrete, far beyond the slabs and blocks we are normally used to see. 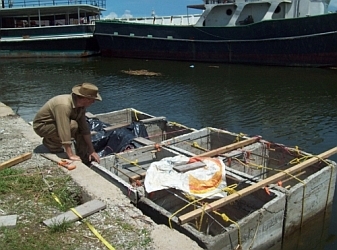 One of the tests of the concrete canoe competition is that the canoe will be filled with water and must still float. The honeycomb structure of the WHY yacht. It is designed to be 58x38m and hold 3000 squarmeter real estate space. So the WHY yacht is a factor 138 Times more expensive than a build along the lines of our method. Nevertheless Wally / Hermes is obviously expecting to have customers at that real estate price. 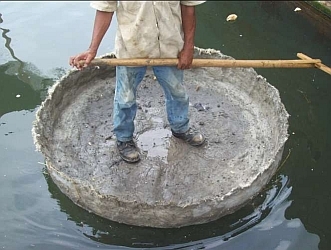 Poor man's floating island. This pilot project was born from a study for the Colombian government to solve the issue of periodical flooding of houses in the Magdalena River banks. The key question was : What is the lowest cost possible to create a floating platform for a floating house. We took the base idea of Richi Sowas bottle island and bonded it together with something tougher than "mangrove roots". What we came up with is to take a pile of floating stuff like bottles,styrofoam break, and bond those "loose elements" together with a fiber cement matrix. The project was geared to use the less neccesary amount of cement bonder (which is the expensive element) and bond a maximum of cheap light low cost filler (bottles, styrofoam, and similar) together, to get a still solid island that would not soak up water. The fiber component consisted in agriculture bags, cocos fiber, bamboo fiber, and similar.The baseline was that things come bonded together in a way that even if you broke the island in the middle non of "loose trash stuff" would fall out. The light and ultralight building methods allow to explore the concepts of freeforming and forming on the fly. 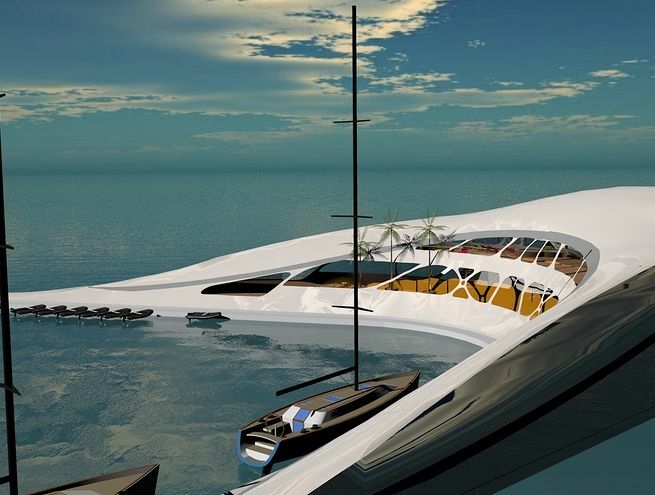 The suggestion: build a 20x10 m demo version of a triangular floating structure compareable to a small version of the WHY yacht 100 squaremeter footprint 200 squaremeter total real estate in 2 floors. 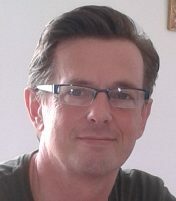 At a total cost of 16.000 USD keeping the already established cost frame of 80USD per squaremeter. Each method group has its specific cost range being the heavy methods the most expensive with up to 800 USD per square meter real estate. The light method group can produce floating real estate at a cost of down to 50 USD per squaremeter. Marine Concrete building from the "engineering book" - what is "out there" already. Why invest in a marina in Cartagena that could be the first seastead some day. • Oceanic business alliance target USD 80 per square foot | making ocean colonization affordable is key to make it massive. Hypothesis: Non massive seasteading is happening already we just call it by other names | Yachting | Crusise Ships | Marine Business | all these have more or less permanent dwellings at protected bays and some at the open sea. What is called seasteading is just the next evolutionary step of those industries. Composite structures and code conformity.